Reminder – July 13 Field Day is Fast Approaching! Recent rains have helped to ensure that we’ll have an abundance of flowers to look at during our Platte River Prairies Field Day on July 13, 2012. It’s been hot and dry – and looks to continue that way for at least the next week – but we’ve had enough rain that most plants will still be green for our big event. And, of course, that means that we’ll have a good supply of bees, ants, spiders, and other critters too! If you’ve forgotten – or somehow missed the initial announcement – you can see all the details here. 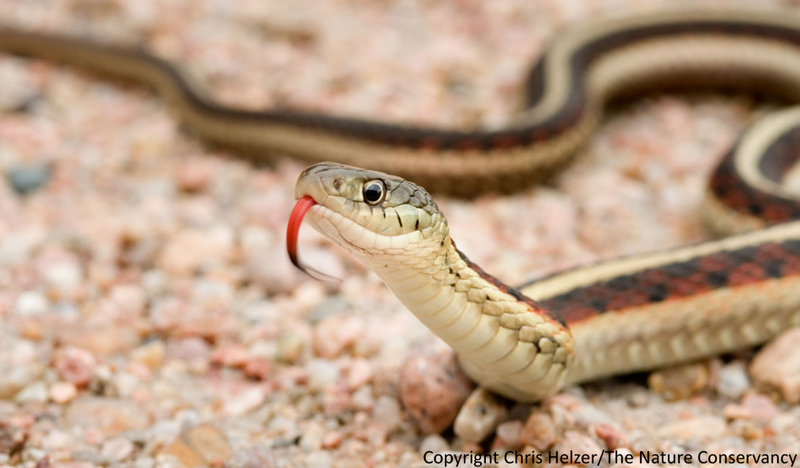 Do you know what kind of garter snake this is? Are you sure? If you come on July 13, you can see a number of snakes and other reptiles and amphibians in person as shown by an actual herpetologist. Alternatively, if you don’t like snakes, you can be assured that there are no snakes in the Platte River Prairies. Not one. As far as you know. We’d appreciate hearing from you ahead of time if you know you’re coming – so we can be sure to have enough snacks and drinks for everyone – but you’re more than welcome to just show up at the door too. It will likely be hot, but we’ll have plenty of shade outside, a big air conditioned building to retreat into if you need it, and lots of ice water to refill your bottles. Please contact Mardell Jasnowski at 402-694-4191 or mjasnowski@tnc.org to RSVP or with questions. This entry was posted in General and tagged field day, hikes, july 13 2012, open house, platte river prairies, tours by Chris Helzer. Bookmark the permalink.